Howdy! 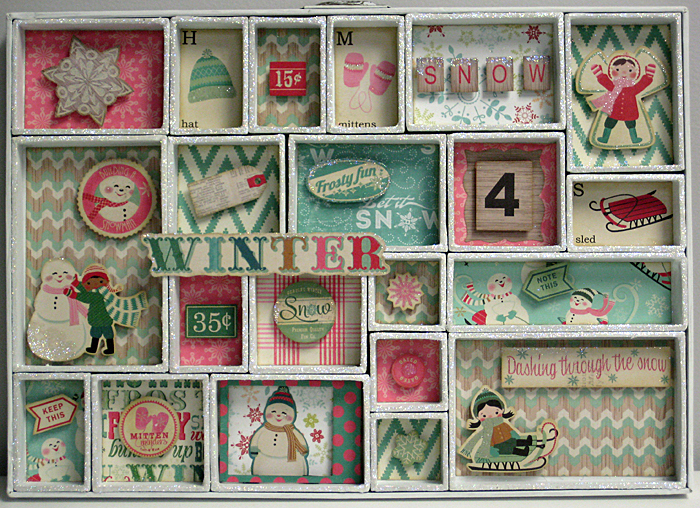 It’s really cold this week here in Michigan, which led me to create this Winter-themed configuration tray. You like? 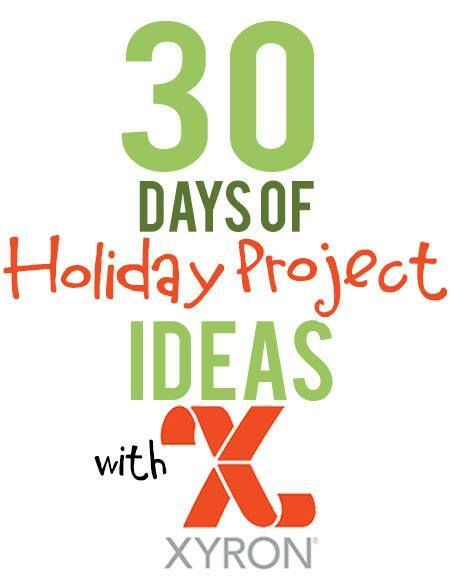 Our Xyron Design Team is sharing 30 days of Holiday Projects with you and I’m up today. 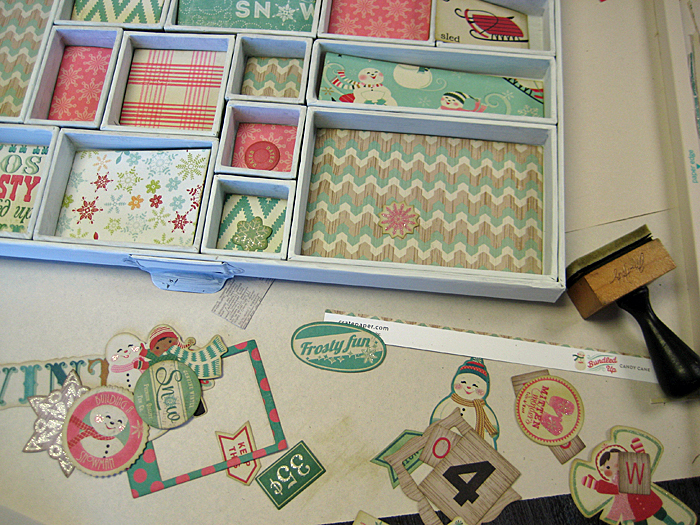 I’ll tell you, I absolutely love this Bundled Up Crate Paper line! The retro style and colors are just so cute! 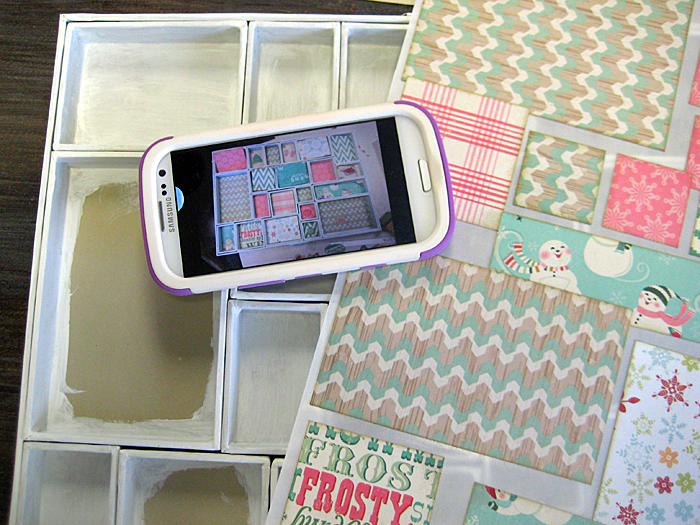 I started out with a blank Tim Holtz Configurations Tray and before opening the package experimented where the die cut pieces would lay; then I took a picture with my phone so I could recall the placement. I’ve also learned to circle the layout of the box I want to use on the package insert. These are hard to get back in place where you wanted them without a map of some sort so this works for me. 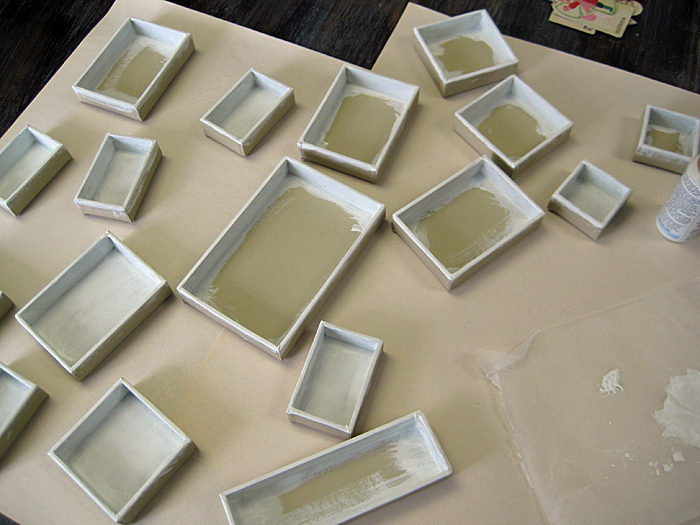 Then I painted all the box edges with white acrylic paint, including the large outer box and let them dry. After measuring the boxes and recording the dimensions I cut all the papers and placed them in the boxes to ensure they fit before applying any adhesive. Trust me, it’s so much easier this way and really doesn’t take that much more time. 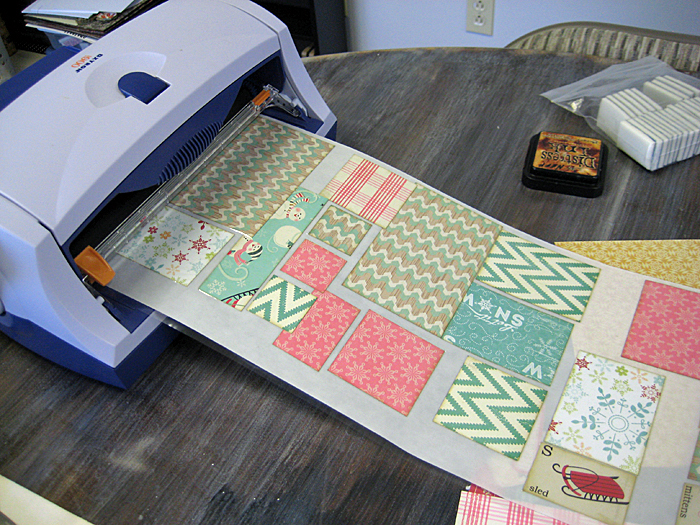 After trimming any pieces (and there are always one or two that need trimming), I inked all edges – even the die cuts – with Ranger’s Old Paper Distress Ink. Then, all the box papers go through the Xyron with permanent adhesive. 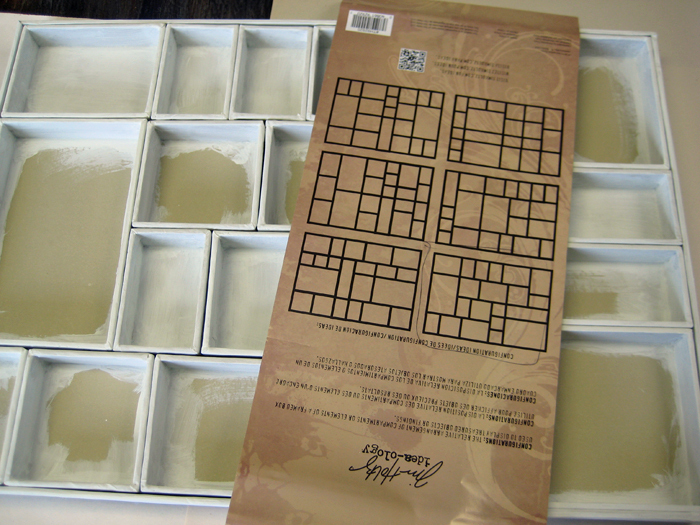 I used my Xyron 9″ Creative Station by lining up the pieces across the loading tray. This box is so easy to assemble with the Xyron adhesive on the back of all the pieces! So it costs about $2 to put all these papers through the Xyron and about five minutes to tuck them into the boxes versus the time it would take to use a different adhesive – love it! You’re probably wondering how I will know where all those papers go. Cell phone! Yep, remember the photo I took in the beginning? I just open it up and follow my little map. The papers are in and I’m thinking it’s needs some more bling. 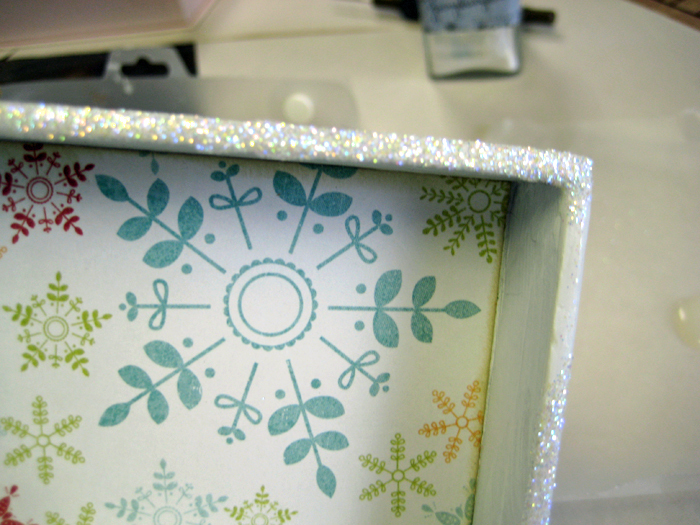 I’m thinking glitter on the box edges so pull out Xyron Clear Hold Adhesive from my Xyron Teresa Collins Adhesive Kit and a small paint brush. 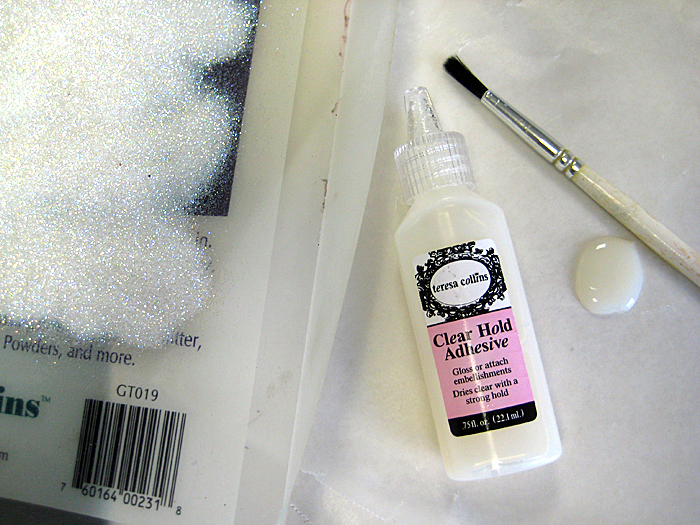 I brushed the box top edges with the adhesive and dipped them face-down into a tray of Donna Salazar clear transparent glitter. Pretty, pretty! This added just the right amount of glitter glistening snow. 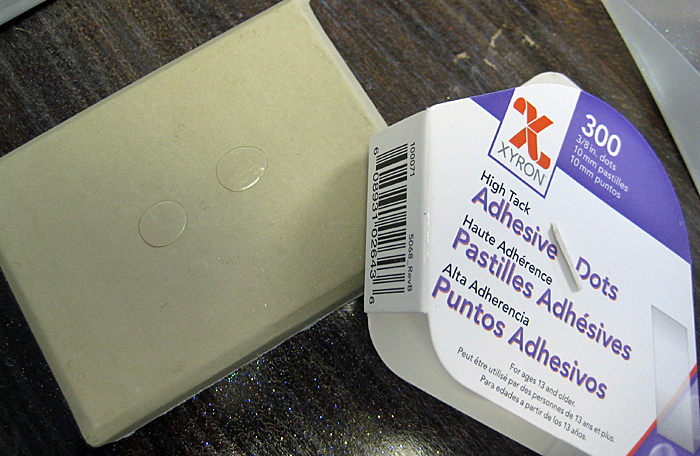 The boxes are held in place with Xyron’s 3/8″ Adhesive Dots. I used two on most boxes and 3-4 on the larger boxes. 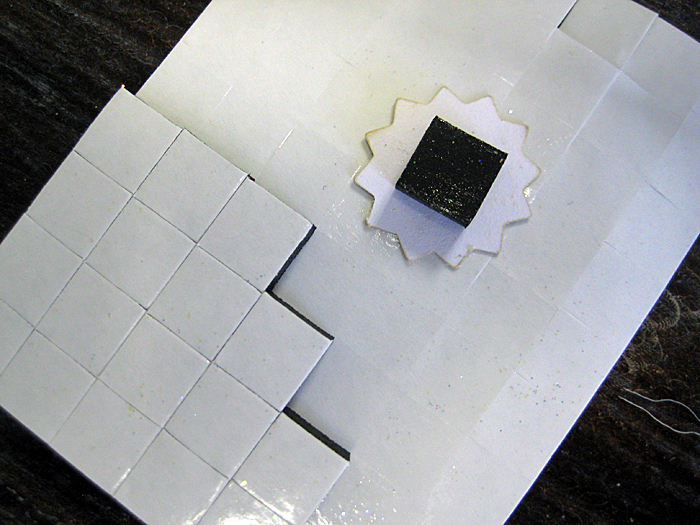 The die cuts are given a little extra dimension by adding Xyron’s Black Foam Squares to the backs. Here’s the finished piece and a close-up. Be sure to check out the Xyron Facebook Page for so many festive ideas from my other Xyron Design Teammates. I love this! You do retro cute very well! This is beautiful. I don’t know where you come up with all these ideas. I LOVE this!!! especially since I’m a Blue and White Christmas decorator. Once again you have done a fabulous job.